A Motorized Suitcase That Takes You and Your Belongings to the Airport « Adafruit Industries – Makers, hackers, artists, designers and engineers! The contraption – with two small wheels at the back and one at the front – is the brainchild of He Liang, a farmer from Hunan Province, reports the Taiwan-based Want China Times. It can carry up to two passengers, cover distances of up to 60km (37 miles) and maintain a speed of up to 20km/h (12mph). It’s powered by a rechargeable lithium battery and can be steered with handlebars when seated. 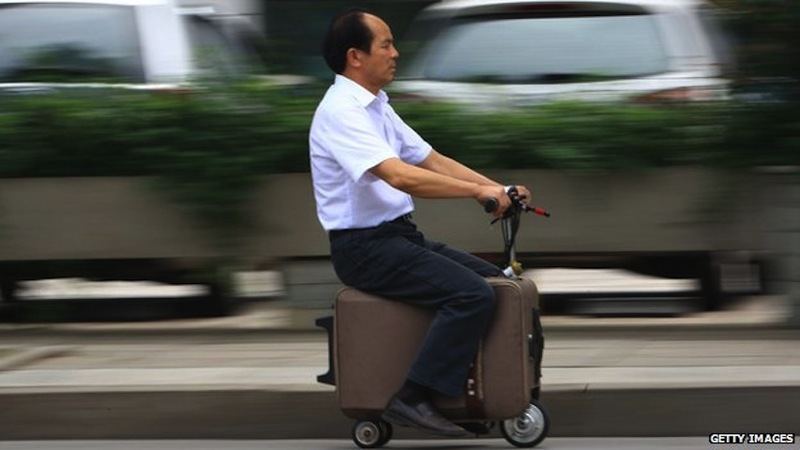 The special suitcase, which He has spent 10 years developing, is dubbed the City Cab. There is apparently just as much space to keep your clothes as with normal luggage and when it’s empty it weighs just 7kg (15lb). The newspaper says City Cabs has now been patented as a multi-functional travel device, and He is hoping to see it on the road soon.